I was a goose and skipped the most recent Lasting Scent Candles pre-order. I must have already used my was budget for the time being or something but I tried to make up for it once she released her RTS sale. I picked up both 1 1/2 ($1.75) and 2 ounce ($2.65) scent shots in a variety of scents. Mostly fallish. Spooktacular- Buttery cookie dough, brown sugared apples, toffee bits, creamy caramel and fall spices. I do think I may have had this one before but not sure. It does mostly smell like a deep and rich, chewy and thick sugar cookie with bits of dark brown sugar and caramel apple bits threaded through. Delicious, toothsome bakery. Toasted Pumpkin Latte- Dark roasted coffee, pumpkin flavored syrup, creamy coconut, sweet vanilla froth and sprinkled with toasted coconut. A new one for my nose, and though coffee is not normally my thing, I do love some Lasting Scent Candles coffee blends. The coffee is super creamy and sweet, just how I like it. The coconut adds the perfect touch to the pumpkin latte. No spice. The Great Pumpkin- Sweet pumpkin with a touch of spice, creamy butterscotch custard, caramelized sugar crust and butter brickle cream. Please pass me the spoon... I have some wax to eat. 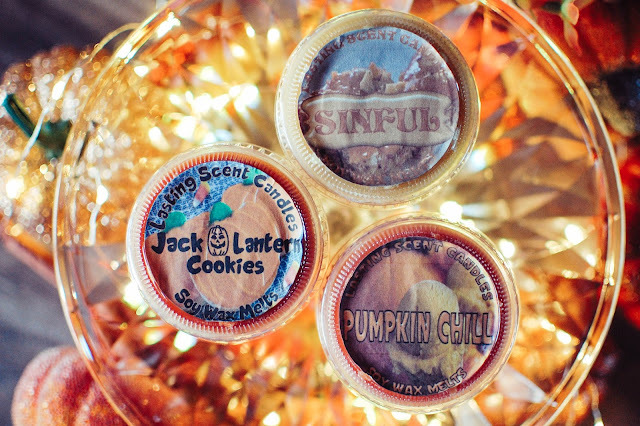 This is seriously the most mouth watering pumpkin treat ever. Not too much spice but enough to add warmth and flavor and all the butterscotch and butter brickle thickness oozing out of it. Sinful- Creamy sweet vanilla custard with a caramelized sugar crust and butterscotch brickle crumbles on top. Repurchase. A classic sticky vanilla and caramel delight. I love the throw on this one and the drool worthy scent of baking goodies it imparts in the home. Jack O'Lantern Cookies- Pumpkin puree, vanilla cream and the best buttery sugar cookie around. Another newbie for me... the gratifying smack of chewy sugar cookies, heavy with vanilla and a dab of caramelized pumpkin creme. Pumpkin Chill- Creamy pumpkin, vanilla ice cream and brown sugar crumbles in a crunchy vanilla waffle cone. Soft pumpkin and caramel ice cream indeed. One to gladden the senses. Dracula's Dungeon- Patchouli, cedarwood, incense and vanilla. Repurchase. One of the most smooth patchouli scents I have smelled in wax. I love how aromatic yet placid LSC's patchouli notes are... I kinda want to be shackled in Dracula's Dungeon if this is what is smells like. So genteel. Wonderfully spicy vanilla. Snappy yet tempered this snug scent really has me stoked to melt it. Glad I bought two. Cast A Spell- Patchouli, cedarwood, mahogany and exotic spice. Repurchase. One of my favorites in this order and I dang near love them all pretty hard. 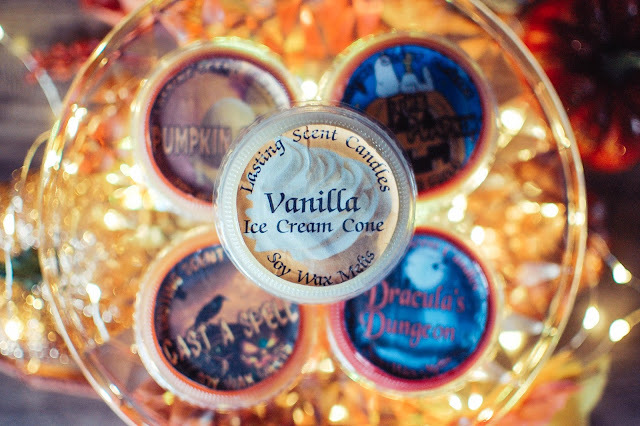 Where Dracula's has that slick edge of vanilla to sweeten it, here there is a more woodsy and piquant edge of spice. Another great rendition of patchouli. Vanilla Ice Cream Cone- Creamy vanilla bean ice cream in a sugar vanilla waffle cone. Pure vanilla cream bliss. Kinda sad I only have this one 2 ounce scent shot but at least I get to experience it. Summer Bonfire- Pink Sugar and Toasted Embers (Marshmallow Fireside). I knew I was bringing these guys home. Summer Bonfire was the one I wanted the most. Pink Marshmallow Fireside is my obsession and I grabbed two of each size in this. Pam knocks both of these notes out of the park in their own right so I knew she would make this blend insanely good. And I was right. A perfectly balanced gooey mallow, pink sugared cotton candy caramel and soft fireside smoke. I am not sure how I can ever bring myself to melt these as I am afraid to run out now. Pam has been teasing us with so many great scents for the next wax opening and she will be hosting an Aroma Mist only opening here soon too. I have used up two and a half of the Aroma Mists I bought last time so I will be headed into both of those openings. What scent blend are you head over heels for at the moment? Did you partake of any LSC lately? 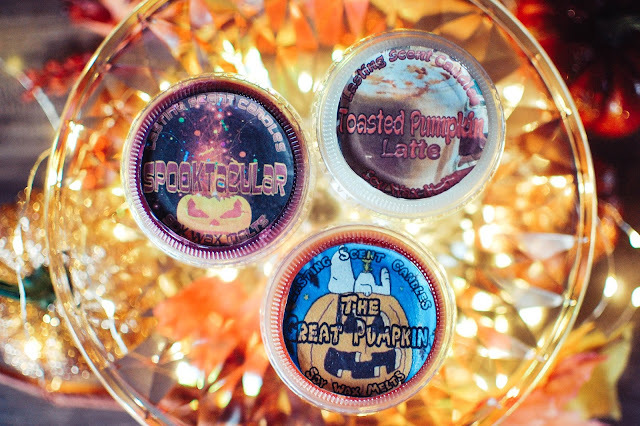 How different are those pumpkin scents? Many of them sound the same with sugar cookie, brown sugar, caramel, pumpkin. Which is the most pumpkin-y? I did not partake. I'm not even head over heels for any scents lately, not even fall scents. *overlydramaticsigh* Not sure what's going on here! What?!?!?! Not enjoying your apple Sweet Fixations scents you have been melting??? It sounded like you were liking them. Oh pooh. I have melted a couple cider scents already. I was going to dive in and do SF's Cozy Home today but our weather has swung back to summer-like, in the low 80s, and now that scent seems out of place so back in the stash box it went. Melted Dessa's something or other instead. Oh good. Sorry about your weather getting warmer though... that stinks. Hope the Dessa's melts well for you. I was all geared up to return to work tomorrow (the students go back Monday) and then I got a text that it was pushed back another day. Now teachers go back Monday and kids go back Tuesday. This is getting me stir crazy. I have so much work to do and we are going to have to make up these days later in the year some how. Ugh. No spring break for you! Oh my, those all sound delicious - like you said, grab-me-a-spoon-cause-I-want-to-eat-it delicious. I love that waffle cone seems to be making a resurgence - it's such a great bakery blender, sugary, buttery and crunchy. Sounds like it might also be scrumptious in that Vanilla Cone one - oh yum. 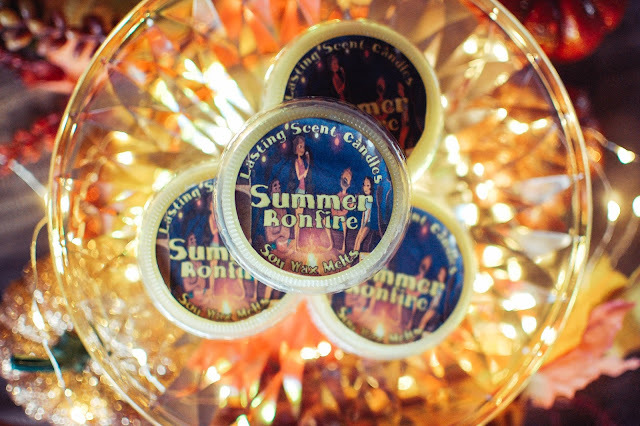 Enjoying doling out your preciouses (Summer Bonfire.) :) I hope you're able to withstand the pull, at least for a little while. 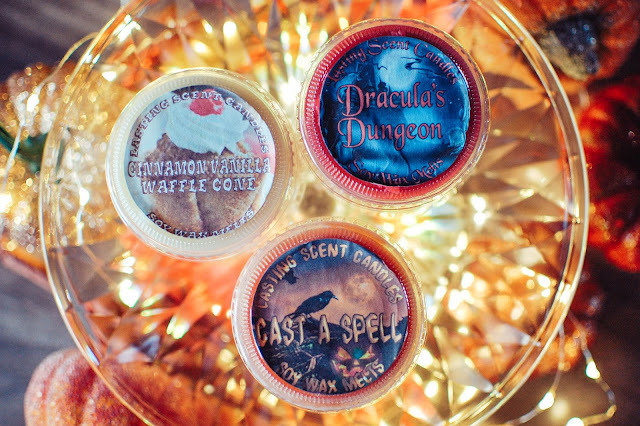 Lasting Scent Candles makes some of my favorite cake, cookie and vanilla scents right next to CFTKR. They are so rich and gooey. I am really loving the waffle cone blends. I kinda wished I had done more in my SMT order. Mmmm... all those fall scents sound delightful! I don't really care for their super soft wax but I do love their scent blends and usually get good performance from them.